Pixar-Disney Animations: A division of Lucasfilm (and Industrial Light and Magic (ILM)), created in 1979 and known as the Graphics Group, was purchased by Apple Computer's Steve Jobs for $5 million, renamed Pixar Animation Studios, and made an independent company in 1986. Pixar Studios (and director John Lasseter) and Disney, in a 1991 deal worth $26 million, created the first completely computer-generated animated feature film - the landmark Toy Story (1995) - Pixar's feature debut film, and everything evolved from there. Their first five feature films grossed more than $2.7 billion (worldwide), giving Pixar the highest per film average gross of any production company. (Although Disney has only owned Pixar outright since 2006 in a deal worth $7.4 billion, the two companies had earlier struck a distribution agreement to jointly begin releasing films together - beginning with Toy Story (1995)). As of 2018, there have been 20 Pixar-Disney collaborations (but none for the year 2014), with more in the pipeline. 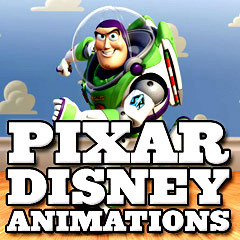 Most of the films produced by Pixar are among the top 40 highest-grossing animated films of all time - box-office smashes. The prequel Monsters University (2013) marked the 14th straight No. 1 feature film, during its debut, in Pixar's history. The first 20 feature films, through Incredibles 2 (2018), have garnered 45 Academy Awards® nominations, 14 competitive Oscars® (does not include John Lasseter's Special Achievement Award for Toy Story (1995)), and numerous other accolades. The first 20 animated films have raked in approx. $5.4+ billion (domestic) and over $12.8+ billion (worldwide) in revenue. As of 2018, nine of Pixar-Disney's films have won the Academy Award for Best Animated Feature Film (Finding Nemo, The Incredibles, Ratatouille, WALL-E, Up, Toy Story 3, Brave, Inside Out, and Coco), and two of the films were nominated for the Academy Award for Best Picture (Up and Toy Story 3). Note: John Ratzenberger, who voiced the Abominable Snowman Yeti in the film Monsters University (2013), has worked on every Pixar film and is considered by some to be a "good luck charm" for the studio. Cowboy doll Woody (Tom Hanks) and a group of anthropomorphic toys come to life when their human owner Andy Davis (John Morris) isn't present, and deal with the invasion of a new toy, space ranger action figure Buzz Lightyear (Tim Allen). They must work together when captured by evil toy-torturing neighbor Sid (Erik von Detten). Tagline: The adventure takes off! with the well-known catchphrase: "To Infinity and Beyond"
An oddball, misfit ant named Flik (Dave Foley) in a colony of hard-working ants hires some other 'warrior' bugs (actually an inept, down-on-their-luck group of circus insect performers) to fight off a band of bullying, rowdy greedy grasshoppers led by Hopper (Kevin Spacey). marked the last film appearance of Madeline Kahn (voice of Gypsy the Moth). All the talking toys return while Andy is off at summer camp - Woody (Tom Hanks) is swiped by an obsessed, avid collector at a yard sale, the owner/manager of Al's Toy Barn, who recognizes Woody as a rare collectible. Woody is about to be sold to a toy museum in Tokyo, Japan, when the other toys rescue their kidnapped friend in a race against time. Monsters (in the Monsters, Inc. scream-processing factory) called "Scarers" power the city of Monstropolis by the screams of scared children in the human world. Top scary monsters include giant behemoth, shaggy-blue haired Sulley (John Goodman) and one-eyed green, ball-shaped friend Mike Wazowski (Billy Crystal), but they themselves are afraid of the children contaminating them. The two are followed back into the Monster World by unafraid little girl Boo/Mary (Mary Gibbs), leading to their exile into the human world where they meet the Abominable Snowman - a fellow refugee. Overprotective and devoted father clownfish Marlin (Albert Brooks) teams up with a friendly large blue tang Dory (Ellen DeGeneres), suffering from short-term memory loss and absent-mindedness, to search for his abducted son Nemo (Alexander Gould), taken to Sydney, Australia's harbor area, and residing in a dentist office's aquarium. Tagline: 71% of the Earth's surface is covered by water. That's a lot of space to find one fish. An undercover suburban family of superheroes (or "Supers"), led by father Bob Parr (aka Mr. Incredible) (Craig T. Nelson), is living in hiding under the Superhero Protection Program. Paunchy Bob Parr is unhappily employed as an insurance claims adjuster. The family is forced to put back on their superhero suits to save the world from amoral super-villain Syndrome/Buddy Pine (Jason Lee), a jilted former fan with a robotic puppet named Omnidroid. Mr. Incredible is aided by his pliable wife Helen/Elastigirl (Holly Hunter), superfast son "Dash" (Spencer Fox), and invisible Violet (Sarah Vowell) who can create force fields. Racecar rookie Lightning McQueen (Owen Wilson), on his way to a tie-breaker race in Los Angeles (the Piston Cup Championship) in a week, accidentally damages the pavement of the main road in the run-down small Route 66 town of Radiator Springs and is sentenced to repave it. He makes new friends along the way, including Doc Hudson, a 1951 Hudson Hornet (Paul Newman), Sally the Porsche (Bonnie Hunt), and Mater the Tow Truck (Larry the Cable Guy). Scrawny Remy (Patton Oswalt), an ambitious anthropomorphic rat with highly developed taste and smell, arrives in Paris to find that his favorite chef Auguste Gusteau (Brad Garrett) has died, so he works together with Alfredo Linguini (Lou Romano), the kitchen's garbage boy, controlling his movements like a marionette, to reach his culinary dreams. The making of ratatouille (French dish with stewed vegetables) for fussy restaurant critic Anton Ego (Peter O'Toole) leads to the creation of a new bistro, named Ratatouille - run by Remy and Linguini. A trash compactor robot named WALL-E (Ben Burtt) whose job was cleaning up waste on Earth in the year 2805, falls in love with another more advanced robot probe named EVE (Elissa Knight), a colder, hostile, white, sleek egg-shaped robot sent from a mega-corporation to look for vegetation on Earth, and follows her back onto her starliner and into outer space for further adventures. After losing his wife, feisty 78-year-old toy-balloon vendor and zookeeper Carl Fredricksen (Edward Asner) sets out to see the wilds of South America (Paradise Falls in Venezuela), to fulfill a promise to his wife Ellie. He flies his house away by tying hundreds of helium balloons to it. Russell (Jordan Nagai), an eager 8 year-old Wilderness Explorer scout trying to earn his merit badge for helping the elderly, becomes a stowaway on the adventure. 18 year-old toy owner Andy is finally leaving for college, and his beloved toys accidentally get donated to the Sunnyside Daycare center. They meet new friends, including Barbie's counterpart Ken (Michael Keaton) and hedgehog Mr. Pricklepants (Timothy Dalton), but soon grow to hate their new surroundings, the deceptive, pink strawberry-scented Lots-O'-Huggin' Bear (Ned Beatty), and abusive fellow toys, and plan an escape to find their way back home. Race car champion Lightning McQueen (Owen Wilson) returns and, with his trusted tow truck pal Mater (Larry the Cable Guy), heads overseas to Tokyo, Japan to compete in the World Grand Prix race, but Mater becomes sidetracked to Europe by international espionage. A free-spirited, reckless Scottish princess Merida (Kelly Macdonald), a skilled archer in the Scottish highlands, doesn't want to live a traditional life. When chaos breaks out in the kingdom when she refuses to marry, she is forced to rely on her bravery and archery skills to fight a terrible ancient curse, bring peace to the land, and save her mother Queen Elinor's (Emma Thompson) life (after transforming into a large black bear). Sulley (John Goodman) and Mike (Billy Crystal) study as freshmen at the prestigious Monsters University, planning to graduate and find work at the Monsters, Inc. factory. They start off as intense rivals (during the final exam of Scaring 101) but soon become best friends by working together (in the fraternity of Oozma Kappa) in the annual Greek Council's Scare Games to impress the evil frigid campus headmistress, Dean Hardscrabble (Helen Mirren), part dragon and part centipede. They lose to other teams (from MU's fraternities and sororities) and are expelled from the University, but take lowly jobs at Monsters, Inc. in the company mailroom, and over time, work their way up. Pixar's/Disney hit computer-animated feature about the personification of the emotions of young 11 year-old Riley Andersen (Kaitlyn Dias) -- Joy (Amy Poehler), Sadness (Phyllis Smith), Fear (Bill Hader), Anger (Lewis Black), and Disgust (Mindy Kaling) -- during a move from Minnesota to the big city of San Francisco. Set in an alternate timeline in which the dinosaurs escaped extinction, when an asteroid missed Earth. Bob Parr (Mr. Incredible) was left to care for Jack-Jack, while Helen (Elastigirl) was out saving the world and battling new supervillain Screenslaver. Tagline: It's Been Too Long, Dahlings. A romantic comedy of the love story between Woody and Bo Peep.